YANG ZHENZHONG (China, b. 1968) has explored spatial relationships in many of his video projects throughout his career. In an ongoing examination of the personal, political and institutional, Yang turns the camera to record actions and construct situations that deliberate from a precise point of view. ‘Using the convention of perspective, Zhenzhong’s LANDSEASKY artwork Passage speaks to the transitional space between spaces. A space that is cut away, removed from all visual references of ‘the other side’. While portraying an exaggerated long space it is in fact a flat screen space that is before us that we must reconcile. Zhenzhong’s work has been shown at the Venice Biennale, 2007; The Museum of Contemporary Art Kiasma, 2007; Shanghai Biennale, Asia Pacific Triennale of Contemporary Art 2006, Van Abbe Museum, 2011; Lyon Biennale 2013.; Guangzhou Triennial, 2012; His works can also be found in collection of significant public and private institutes such as MoMA New York, IKON Gallery (UK), Fukuoka Asian Art Museum, Musée National d’Art Moderne and the UBS Collection. GIOVANNI OZZOLA (Italy, born 1982) works primarily in video and installation. Central to Ozzola’s practice is the exploration of three-dimensional space and its relationship to light. In Ozzola’s work for LANDSEASKY, ‘Garage – sometimes you can see much more’ 2009-2011, the senses sharpen in the dark and are then overwhelmed by the strong light of a wider space. A tribute to Edward Hopper’s “Rooms by the Sea”, the rattling, mechanical movement of the rolling door shutter clashes with the opening of the horizon onto the sea. The shutter operates as a diaphragm between two dimensions. 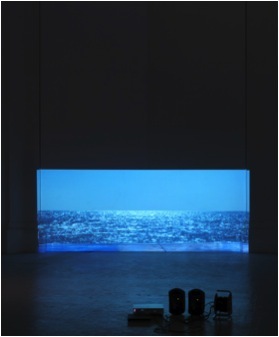 The video sequence of a roller door rising and falling dramatically alters the viewers’ perception of the room the work is installed within. Ozzola has exhibited internationally including The Chelsea Art Museum, New York; Sharjah Maraya Art Centre, Dubai; Galleria Continua, San Gimignano/Beijing; Mori Museum, Tokyo; Elgiz Museum Istanbul Turkey; Fondazione Stelline, Milan Italy.